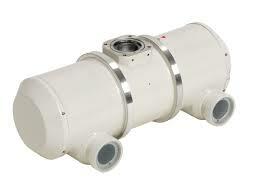 High speed rotating anode X-ray tube assembly for high energy radiographic and cine-fluoroscopic operations. The heavy anode is constructed with specially processed rhenium-tungsten faced molybdenum target which is 74 mm diameter and has an improved coating to increase thermal emissivity. 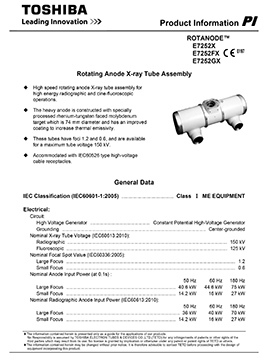 These tubes have foci 1.2 and 0.6, and are available for a maximum tube voltage 150 kV. To be obtained with AID starter Model 60/180. The speed up time from normal speed to high speed is 2/3 times of the specified speed up time from 0 to high speed, which is described on motor rating table. To be applied for high speed rotation. No more than two high speed starts per minute are permissible.